This nut roll recipe hails from an old family friend and is a Christmas staple. It only requires one rise, so it’s easy to churn out a ton of nut roll! It’s Christmas week and we need to talk nut roll! 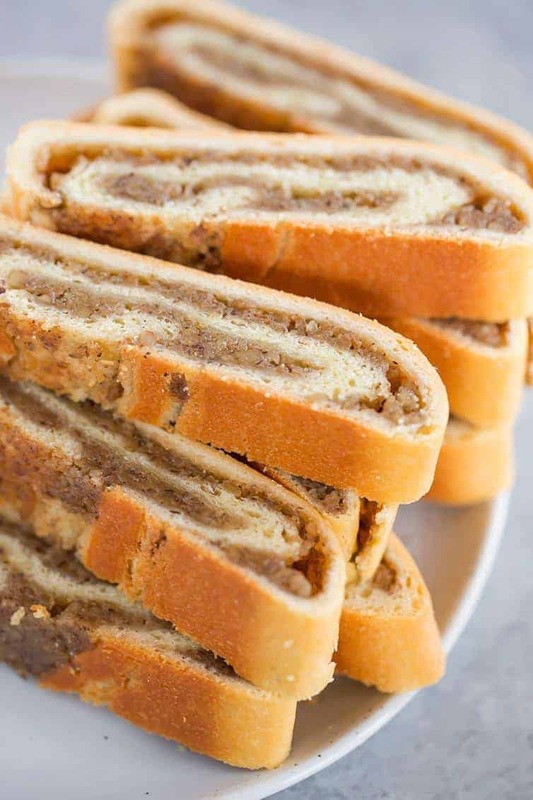 I’ve seen this called nut roll, Hungarian nut roll, Slovak nut roll, Polish nut roll, kolache, even Pittsburgh nut roll, which blew my mind when I saw it! I didn’t realize they were so synonymous with this region, but that makes me just plain giddy. 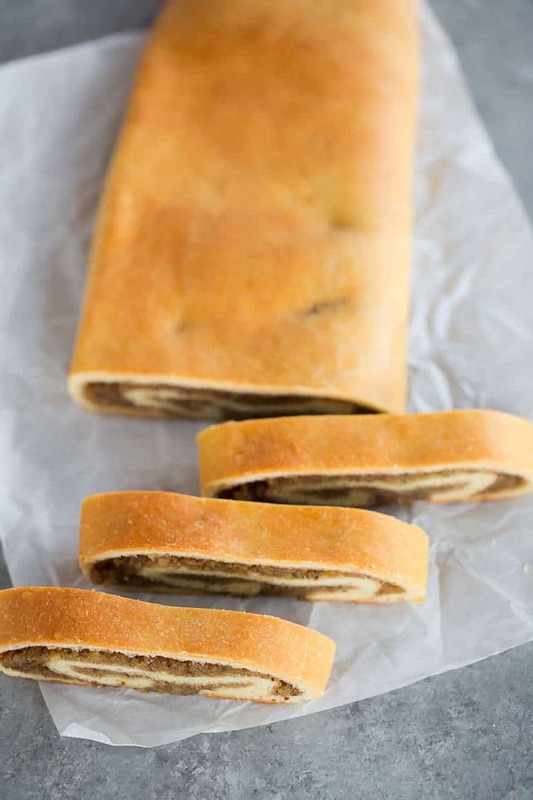 Whatever name you go by, traditional nut roll is a soft sweet dough that is filled with a sweet walnut mixture. It basically tastes like Christmas and it wouldn’t be the holidays without devouring an embarrassing amount of nut roll. I originally shared this nut roll recipe with you nearly six (SIX!) years ago, and SO MANY OF YOU have made it year after year for the holidays, which just makes me so ridiculously happy. In that time, however, I’ve received a lot of questions about two very specific components of this recipe: (1) the use of cake yeast; and (2) some issues with the dough splitting open and filling oozing out during the baking process. I’ve gone back and re-worked the recipe a couple of times to help troubleshoot those issues, and I’ve got you covered! The original recipe calls for cake yeast, which is typically sold in the refrigerated section of the grocery store near the butter. When I first began making this recipe, I bought cake yeast all the time, however, it hasn’t been stocked in my regular grocery store for some time now, and it sounds like the same is the case for many of you. I recently made a batch of this nut roll substituting active dry yeast and I had no issues whatsoever. One fresh cake yeast is equivalent to three packages of active dry yeast, so you’ll see that substitution option listed in the recipe below. The most important difference to keep in mind is that the temperature of the water needs to be different based on the type of yeast you use. For fresh cake yeast, you’ll want a lower temperature to activate the yeast, while the active dry yeast requires a higher temperature. Next up is the issue of the dough splitting and the filling oozing out. I think I have this one figured out! The last time that I made this, instead of adding all of the flour, I added a little at a time and then stopped once the dough was no longer sticky, and I still had quite a bit of flour left. And what do you know? Those rolls had perfectly smooth dough from start to finish on ALL of the rolls – no cracking, splitting or filling spilling out. I’m convinced that the issue had to do with the dough being too dry and, as a result, cracking and splitting, which can cause the filling to come out. The exact amount that you use will vary wildly depending on the time of year, the ambient air temperature and humidity levels, but definitely go with a little flour at a time, and then stop periodically to feel the dough as you near the end of the flour. It shouldn’t be sticky, but should still be quite soft and supple. So that’s it! This is my go-to nut roll recipe and has been for years, and I hope I’ve made it a little bit easier for you to tackle it. At first glance it might look like a lot of work (8 nut roll!) but it’s really not a lot of hands-on time and they only require one (long) rise, so totally doable. I made my Christmas batch last week and managed to get them totally mixed and assembled in an hour while Joseph was at preschool and Dominic was napping. I left them to rise and baked later that afternoon. Done! You can buy nut roll from bakeries and tons of churches in this area around the holidays, but I’m always surprised once I dig in and tackle them at how uncomplicated they are. If you’ve been too intimidated to try nut roll before, have no fear! I’ve also successfully scaled this recipe, so if you don’t need this many nut roll, feel free to cut it in half. In a word, this nut roll recipe is spectacular. Too often I’ve had nut roll that are doughy and dry and/or don’t have enough filling. The dough for this recipe is very, very soft, and the filling is supremely moist. Plus, the filling-to-dough ratio is very high, which keeps everything from drying out and packs a ton of flavor into even the smallest of slices. I hope you’ll give these a try and that they become one of your Christmas traditions as well! 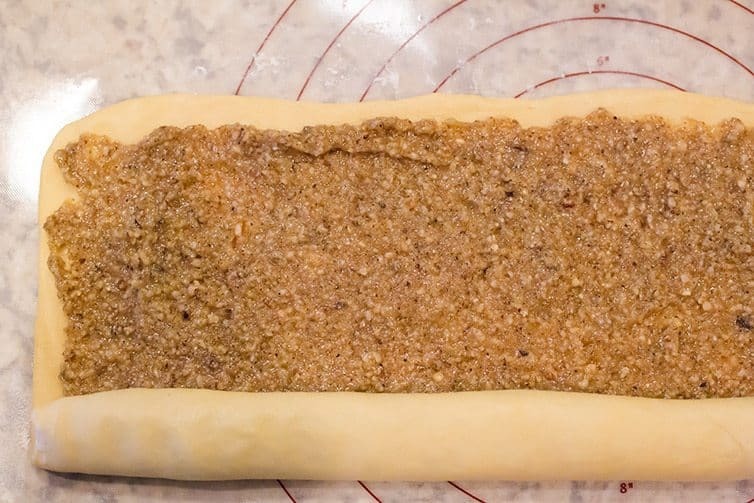 This nut roll recipe hails from an old family friend and is a Christmas staple. It only requires one rise, so it's easy to churn out a ton of nut roll! Make the Dough: Dissolve 1 teaspoon sugar into the ½ cup warm water (if using fresh cake yeast, the water temperature should be between 90 to 95 degrees F; if using active dry yeast, the water temperature should be 120 to 130 degrees F). Crumble the fresh yeast or sprinkle the active dry yeast and stir to combine. Let sit for 5 to 10 minutes, or until foaming. In the bowl of a stand mixer using the paddle attachment, beat the eggs on medium speed until combined, about 1 minute. Add the sour cream, melted butter, sugar, vanilla, salt and the softened yeast. Mix on medium speed until smooth and well-combined, about 2 to 3 minutes. Switch to the dough hook, reduce the mixer speed to low, and add the flour a little at a time, until the dough does not feel sticky but is still soft and supple. Continue kneading until the dough does not stick to the sides of the bowl. Cover with a damp dish towel while you prepare the filling. Make the Filling: In a large bowl, combine all of the ingredients for the filling, stirring well to ensure that it is completely mixed and all of the ingredients are incorporated. 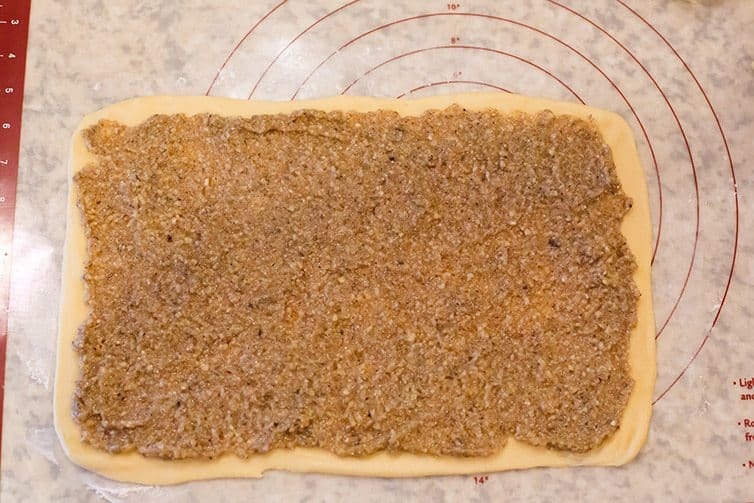 Assemble the Nut Roll: Line four baking sheets with parchment paper or silicone baking mats. Divide the dough into eight pieces. On a clean work surface and one at a time, roll each piece out into a 9x14-inch rectangle, using flour if necessary to keep from sticking. Spread one-eighth of the filling to within ½-inch of the edges. With the long side in front of you, roll up gently and pinch the seams shut. Place on the prepared baking sheets, 2 rolls per sheet. Cover loosely with plastic wrap. Repeat with all eight pieces of dough. Place the baking sheets in a draft-free area and allow to rise for 3 hours (the rolls will puff and swell but will not look huge). 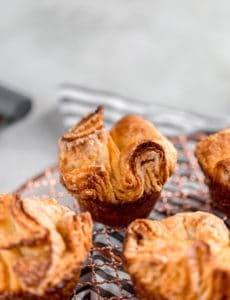 Bake the Nut Roll: Preheat oven to 350 degrees F. Bake one pan at a time for 20 to 25 minutes, or until the tops are lightly browned. Cool completely before slicing. Wrap leftovers tightly in plastic wrap and store at room temperature for up to 1 week. The nut roll can be frozen by wrapping in plastic wrap, then again in foil, and stored in the freezer for up to 2 months. Thaw at room temperature. If you do not have a stand mixer, you can mix and knead this dough by hand. You can cut this recipe in half to make only four rolls instead of eight. This recipe was originally published on January 10, 2011. My Pittsburgh grandmother has always made nut and apricot kolache at Christmas and Easter, but now at almost 95 she is finally slowing down a little and the past few years hasn’t wanted to deal with it, so the tradition has been passed on to me. Like so many other grandmothers, she never actually used a recipe and that made it really hard for her to tell me how to do it (for example, “well, you add enough flour until it feels right. I don’t know, like 4 cups. Or maybe more. Maybe like 10 cups? I don’t know, just enough to make it feel right” – that’s pretty hard to emulate!!) so I was looking for some help. I found your recipe 2 Christmases ago and I’ve used it faithfully since then – it isn’t exactly the same as my grandmother’s, but it’s close enough that even my dad, who has been eating her kolache his whole life, enjoys it at holidays. Anyway, the moral of this story is, I love your recipe and my whole family has been enjoying it for a couple of years now. Thank you for sharing it!! I’m a seasoned baker and have a few questions to clarify. I am of Polish descent and have my mother’s original recipe for nut rolls. However, it makes 15 long rolls and since I am over 70 no longer have the stamina for making that many rolls. I have always used the cake yeast in the past but you just cannot buy it anymore. In your recipe you state that if you use the cake you put it in liquid and also the same for the dry yeast. I have always heard about sprinkling the dry yeast and not having to mix in liquid. What can you tell me about this. I need to learn to use the dry yeast and forget about the cake. Also, if you make 1/2 of your recipe do you still use the 3 packets of dry yeast or a whole cake? I would say yes but again just want to clarify. 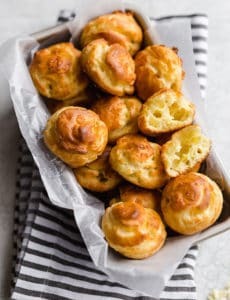 I’m hoping this recipe works for me as I am looking for a nice soft dough to roll and these look and sound really nice. Thank you in advance for the information. I need to teach this old dog some new tricks. Happy Easter !! P.S. we’re neighbors in this area of the state. I’m from Uniontown 50 miles south. Lorraine. 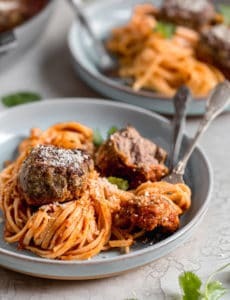 Thank you for posting such an easy to follow recipe! I’ve been so longing to try to make these at home, it looked so difficult it scared me. You made it very easy. This is just like my cousin’s late Gramma K used to make! So thrilled! It came out pretty well! Making some to take in my luggage for my family to enjoy while on vacation! 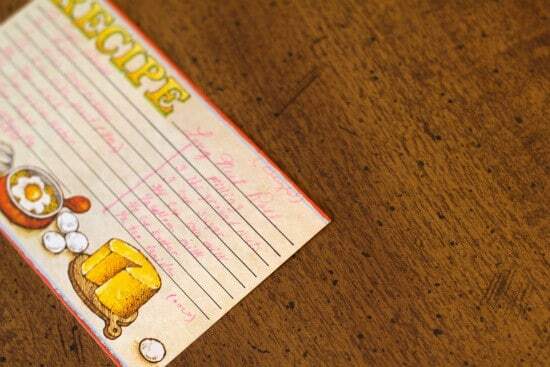 Thanks so much because Gramma K’s recipe card was pretty sketchy with the info. i had a problem .rising three hours my rolls went vey flat i looked at other recipes and mow of them said to rise only about 20 minutes and one recipe said after kneading rise in bowl i hour what did i do wrong. Judith, you will not like this answer but no one can give you an exact measurement of the flour. Everything affects how much you will use. Temperature at home, humidity outside, the flour itself, if your wet ingredients are measured exactly etc. I remember when I first made home made bread and I asked my mother the same question and she said you will be able to tell. Well, that didn’t help me I didn’t know what it should feel like so here is the best answer I can give you. I’ve been making these and dough for 50 years and if the recipe calls for 5 cups of flour it will take most of it but start paying attention when you start using that last cup. You want the dough to be just not too sticky. If it sticks to your fingers then add a little more flour. Easy on the flour. If its still too sticky then add a little more. You want to stop when it isn’t real sticky. When you put it on the board and if its still a little tacky then add a little more sprinkle till it no longer sticks to your hands. But go easy. You can always add more but you can’t take it out. Don’t give up. Try this a few times and you’ll get to know just when the dough “feels” right. I wish you the very best and if I can help you at all contact me at lkoschock@outlook.com. I’d love to see you succeed at this. 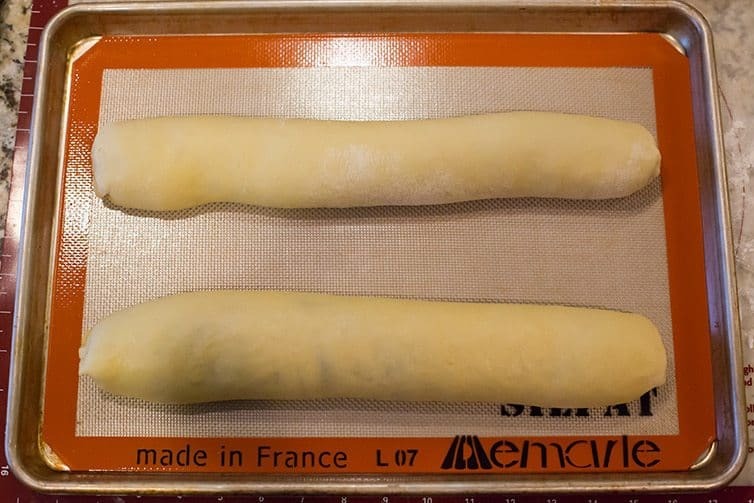 Once you learn this step you can make anything with dough. And its a wonderful feeling to make your own fresh bread and rolls. Absolutely delish!!!!! Been searching for a nut roll recipe forever. Originally from the ‘Burgh, but live in NY now. Tried a different recipe that uses bread flour. I liked the texture of the dough, but the filling was gritty. Yours was MUCH better, and I will be sticking with it. I literally groaned in nut roll heaven when I tasted it, haha. Have you ever tried bread flour with this recipe? The other recipe also called for an egg wash prior to baking, which I liked, and instant yeast instead of active dry. That didn’t seem to matter much for me, although instant yeast was nice not to have to proof. Thanks for a wonderful recipe! This is the second time I’m making these now. Everybody loves them. I give them to my mother in law, my coworker and neighbor. I tried to lower the stuffing to 3/4 because they open the first time I made them. But I think that’s because of lack of experience because it was my first time to make them. Next time I will use the whole measurement of the stuffing. Thank you so much for the recipe. I’m becoming a master of nutroll. Wow! Your photos look so much like my family recipe for potica., aka Slovenian nut roll, with the long flattish rolls. My family is from Cleveland–and a few generations back, Slovenia. We have five generations of potica bakers in the family. Sour cream in the dough for us too–but ours is refrigerated. And the walnut filling is uncooked–and it includes lots of honey! But whatever you call it, it is terrific! I am trying to figure out how many cups 3 lbs of ground nuts would be? Wish it would have told in the recipe. 1) filling is too sweet. Next time I will forgo the CM and will start with 2 C sugar and add additional sugar to taste. 2) Filling needs spices- cinnamon and ground clove. I tried the filling once everything was mixed and felt that it was missing something. Adding those two spices created a better flavor profile. 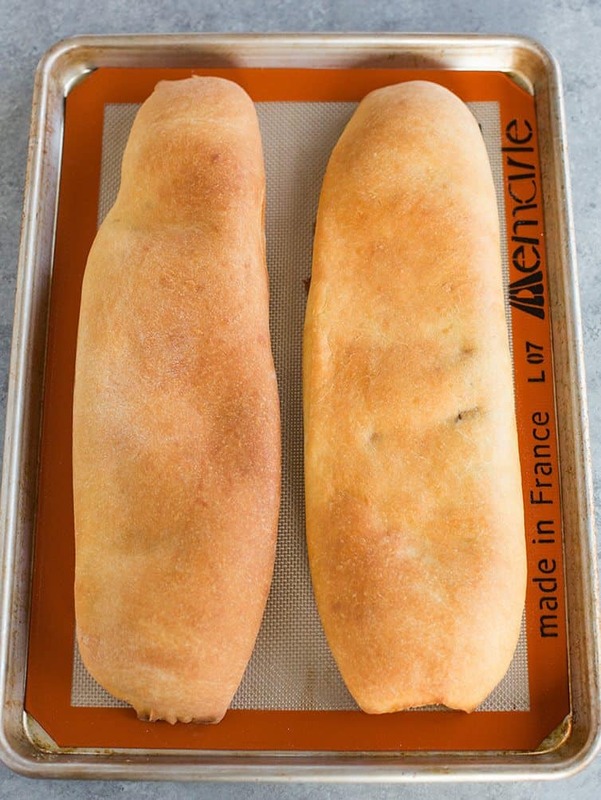 I just started adding these in by the 1/4 t so not sure exactly how much I added but I would say 1/2 – 1 t cinnamon and 1/4 – 1/2 t ground cloves; 3) Too little filling per roll leaving end product with too high a bread-to-filling ratio. Next time will do what another reviewer suggested and make only 6 rolls instead of 8. 3) Egg wash before baking. Also, it’d be very helpful if you could include in the recipe how much filling goes into each roll since it’s really hard to accurately divide a wet mass into 8ths. I have used this recipe for years now. I thought the bakers should know that the consistency of the nut filling is paste-like. I drop large spoonfuls of the filling ono the rectangular dough and spread it with the back of a spoon. The dough should stand up to the spreading. 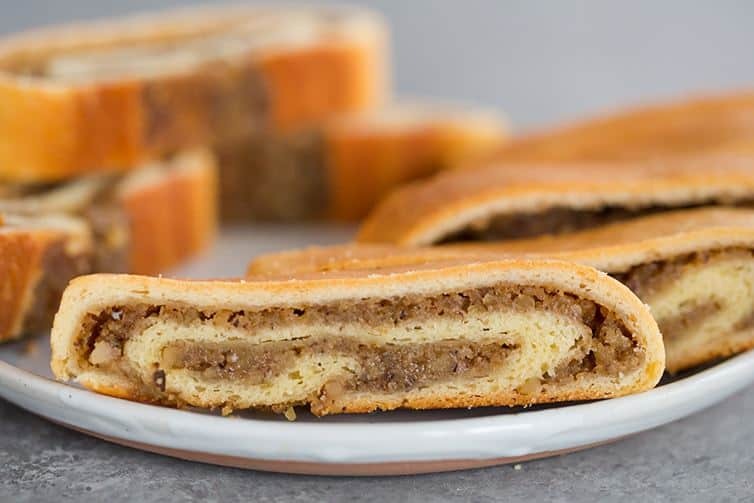 i’ve somehow never made nutrolls before somehow…my dad always orders them from the Buttonwood Bakery in either WilkesBarre or Scranton, but this year I tried your recipe and I am always going to make them from now on. I ran out of filling after 4 – mine were SO filled and delicious. I ended up throwing in some sweetened cream cheese and amarena cherries and now my family wants me to make half like that next time, today I picked up some poppyseed filling that was somehow for sale in my little NE town grocery store and I’m thinking poppyseed bread next! My great aunt used to make these when I was a kid and I haven’t had one since! I bought one today from a Polish store and it was good but NOT the same. I should have searched here first! lol I’m definitely going to try this!! Thanks for all the great recipes and for sharing your adorable family! My great grandma is from Poland and would make this every Christmas. She has since passed, and my nana, my mom and now me, make this now for the holidays. My recipe from my great grandma is hard to read, so I am excited to try this one and see if its close to hers. Thank you for the updates! This is a great recipe that I have used for the last several years. I do have a hard time finding cake yeast and the place I usually get it is out until next week! I also have had issues with the splitting but it always tastes good so it never really bothered me! I am excited to try this again!!! I made your nut roll last year for the first time. You are right, it is soft and deliciously sweet, just like my Mom’s used to be. The one addition I made was to strew golden raisins across the nut mixture before rolling it up. They freeze well, and I thawed one out for my sister’s visit in May. She agreed it was the real deal!Thanks from a Slovak-Russian girl originally from Akron! I was going to make this for my son’s international feast. Can I make it ahead of time and freeze it or will it not be as good? Or, should I just make it the afternoon before and put in a ziplock? Also, I have learned that in Croatia this is called Orehnjaca.